CE Kron & Co. was founded in 1987, and began making bagpipes at Dobbs Ferry in 1988 under the name Kilgour & Kron. The original workers were myself and George Kilgour of Edinburgh. 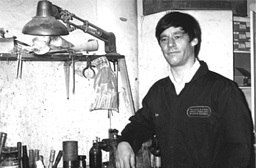 George learned the trade at James Robertson's shop on Grove Street in Edinburgh. He stayed working for me in America until the summer of 1995, at which point Dave Atherton came to work. Dave learned extremely quickly, and since shortly after that time the company has been making the finest bagpipes available today. We use a combination of old world tradition and cutting edge craftsmanship. These bagpipes and pipe chanters are played worldwide. In the past five years, due to refinements in our pipe chanters, we now offer two lines of chanters that are sought after by soloists and bands. Dave left in 2007, after twelve years. I now have two other very promising workers, and CE Kron & Co. continues to make the world's finest bagpipes and pipe chanters.